They're baack! The poets from Fat Poets Speak: Voices of the Fat Poets' Society again embrace their lives as fat women in a thin-loving culture and write poems about negotiating their days among different, sometimes dangerous and hate-filled worlds. But they are more than just their voices. They are women who live and love with gusto, passion and yearning—they live and love fatly. Fat Poets Speak 2: Living and Loving Fatly takes you on a journey through the days of these deeply angry, loving, creative poets. Experience the stages and states through which they travel in the space of 24 hours, in the space of a week, through the months of the year. Laugh, cry, commiserate and celebrate as the poets guide you through highs and lows, sadness and joy, grim defiance and determination and stunning pinnacles of loving and understanding. Especially lush and sensuous poems are starred for the benefit of readers. The contributors from the first volume, Fat Poets Speak: Voices of the Fat Poets' Society, are back—with the exception of Corinna Makris Winter, whom the poets hope will be able to join them again in the future. This second volume proudly adds Eileen Rosensteel and Mary Ray Worley, founder of the Fat Poets' Society at a NAAFA convention in the Boston area in 2006. 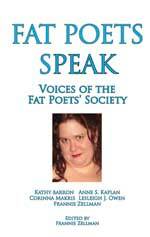 Fat Poets Speak 2 also features one poem each by four new voices, activists in the fat acceptance movement. The Fat Poets' Society is donating royalties from the first volume, Fat Poets Speak, to the National Association to Advance Fat Acceptance. 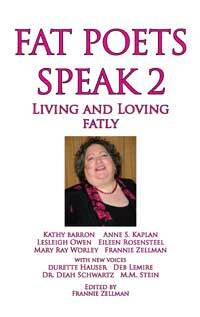 Royalties from Fat Poets Speak 2 will be donated to fat activist Ragen Chastain.